A New York Cheesecake Recipe can be a controversial subject in the culinary world. There are dozens and dozens of kinds of cheesecakes around the world, each somewhat different in terms of ingredients and baking technique and named for the particular area or country to reflect the most common way of making a cheesecake in that area. In general, cheesecakes can be made of ricotta cheese, Neufchâtel, Havarti, Mizithra cheese and Mascarpone cheese, tangy cottage cheese and quark. But most commonly in America they are made with cream cheese. Other ingredients such as sugar, eggs, cream, honey and fruit are often mixed in as well. Cheesecake is one of the most common tart-like or custard-like desserts and one of the oldest desserts containing cheese. 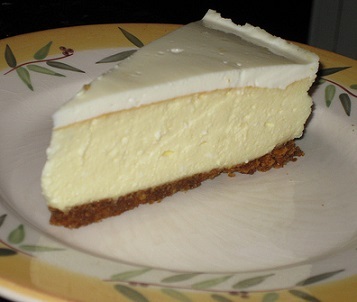 New York-style cheesecake typically has heavy cream and/or cream cheese, eggs and egg yolks to add richness. No wonder David Glickman, cheesecake cooking guru, said, "Cheesecake is really a canvas." 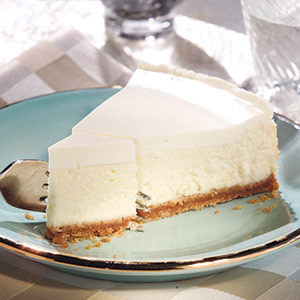 American cheesecakes generally rely on cream cheese, invented in 1872 as an alternative to French Neufchâtel. 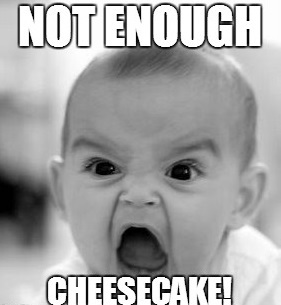 And when pasteurized in 1912, Philadelphia cream cheese became the top product for making cheesecakes in America. 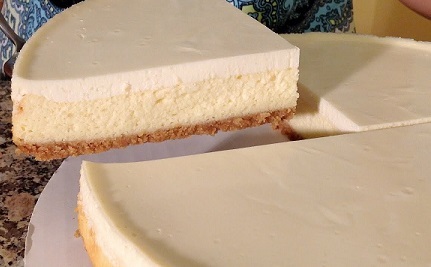 Cheesecakes have a tendency to "crack" when cooled. There are various explanations for this and methods to attempt to prevent the cracking but for this restaurant recipe - don't worry about it. The Sour Cream Topping will take care of any cracking that may occur. Cracking does not affect the taste, fortunately. Remember, do not be alarmed if cracks appear on the top after baking. They are characteristic of this recipe. TA-DA! It's ready to serve and enjoy. Repeat cutting process until all servings are sliced or only slice the number of servings you need immediately. Enjoy your restaurant dessert recipe for this delicious New York Cheesecake and the company of those you share it with!